The ATV LifeGuard® is a flexible arc, commonly known as a Roll Bar, CPD (crush protection device) or OPD (operator protection device) that mounts on the rear carrier of a quad bike (or ATV), providing space under an upturned quad in the event of a rollover. Unique in the fact that it’s flexible and absorbs impact, and because of its passive nature, the ATV Lifeguard reduces the chance of injury being inflicted on the rider by the unit itself. The award-winning LifeGuard is a world first in quad bike safety, designed to save lives and prevent major injury. The unit retails for $1300, including GST, and is available through Ag Tech at atvlifeguard.co.nz. 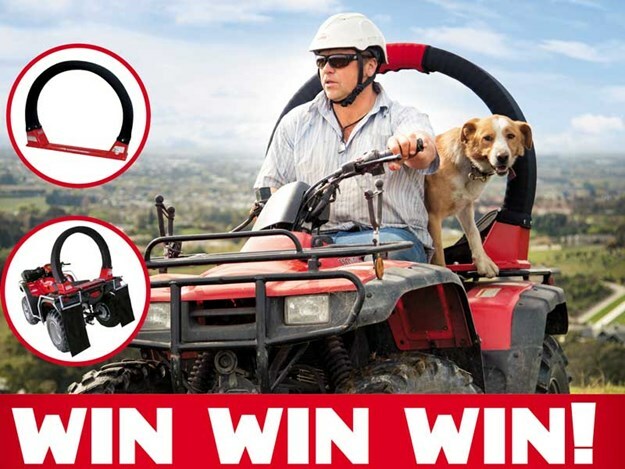 Enter to win an ATV Lifeguard and increase your farm bike safety. To enter, click here and don’t forget to share what model bike you have. Entries closes on 29 April 2019.